Tomorrow's a pretty crazy day for me and I'll most likely be off-line, so I'm posting my H post today! According to online sources, the Harvard comma (also know as the serial comma or Oxford comma, and sometimes referred to as the series comma) is the comma used immediately before a coordinating conjunction (usually and or or, and sometimes nor) preceding the final item in a list of three or more items. Okay, here's a good example of the Harvard comma in action: a list of three countries should be punctuated as "Portugal, Spain, and France" (with the Harvard comma placed just after Spain and before the and) - not as "Portugal, Spain and France" (without the Harvard comma). I’m not gonna lie, I'm a big fan of the comma in general - even more so of the Harvard comma. Probably because while tiny in stature, it serves a muey important function. Like ensuring that writers don’t fly through their writing without taking a single breath. Or, yanno, separating a series of words from one another so there isn't any confusion. But I find it quite humorous how so many of us disagree on the proper usage of this diminuative dash...which now brings me to your opinion. 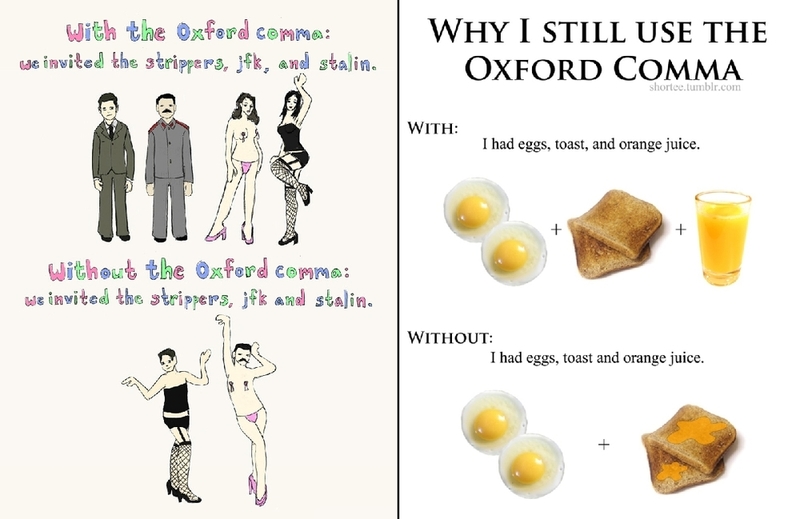 The Harvard comma (or serial comma or Oxford comma): Are you a believer?